Hey, hey scrappy friends!! 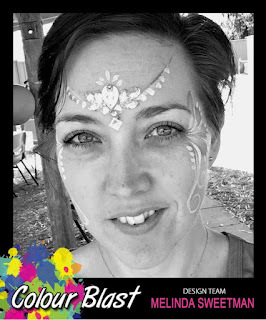 Today I'm here with you sharing my latest DT make for Colour Blast Australia. And this page was inspired by this month's challenge and a very cute kit I won from an Aussie company, Kit The Habit. So, feathers!! I love feathers and was so excited when I received this little kit in the mail with all of those gorgeous texture-y feathers, swoon! Onto the step by steps! First up I used a fun feather stencil by Flutterby Designs paired with the gorgeous Sienna Colour Paste and just applied a small amount in a small area on my page in my art journal. While that dried I decided to colour my fabric doily using the beautiful Just Blue Colour Shimmer Spray. I left that mostly to air dry (I did get a little impatient!!) and then added some colour using my Just Blue Colour Shimmer Spray. I simply sprayed right onto the page and then lifted and turned it to get the colour to move all around my stencilling. I did air dry that and when it was done I did some splatters using Sienna and Just Blue Colour Shimmer Cubes. I also did some splatters with Roadbase Colour Spray. Lastly I added a little bit of colour to a few flowers using a paint brush and my Sienna Colour Shimmer Spray. When that was all dry I added all my bits on and LOVE the finished design. Again, another "not typical for me" page but I am so loving doing different things and playing with products!! 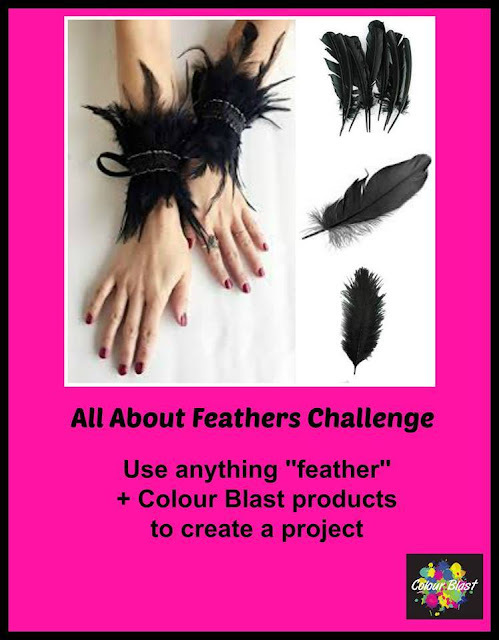 You still have almost the whole month to get your groove on and play with your products, just make sure you incorporate feathers in some way!! Happy scrapping and I'll see you again soon!